Puerto Banus is located just a little to the west of Marbella. Since its initial development some forty odd years ago, it has been known as the play ground for the rich and famous and an ideal place for them to moor their luxury yachts. All along the quayside there are restaurants and street cafés where you can sit and watch the world go by whilst taking in the vista of these magnificent boats. Just behind the port, there is a huge open square where there are more shops - from designer boutiques and fashion outlets to more everyday retailers - and, of course, the huge department store of El Corte Ingles. Here you'll also find plenty of banks, more restaurants (both the well know chain establishments, fast food outlets and individually styled eateries), and even an open-air playground. 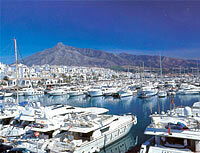 Puerto Banus, in addition, boasts a large cinema and well know casino. If you fancy a trip out to see the port and the mountains from the sea, you can charter a boat from the promenade. The beaches of Banus are sandy and all have the European blue flag standard for cleanliness and facilities. When the sun goes down, Banus certainly doesn't sleep! In fact, some people say this is when it really gets going! There is a huge selection of bars, clubs and discothèques to cater for just about everybody! The heart of this is one street in from the quayside. On Saturday morning the large and popular street market runs from the bullring up the hill to Nueva Andalucia. It's an ideal location to pick up some bargains!